We are Kingston's most trusted technology partner! award winning team of experts in managed IT services and solutions. Whether you’re a small business, a business network with multiple locations and many remote staff, or you’re somewhere in between, we tailor our services and solutions to help you address your specific IT needs and challenges. Are you experiencing unexpected system outages and downtime? Do you want to take advantage of 'the cloud', but you're not sure how? Is your network at risk of being hacked? Are your IT costs too high and unpredictable? Would you like to support satellite offices and your staff who are working remotely, but you can't? Are you and your staff spending too much time on your IT and away from meeting your core business goals? Are your backups failing and you're losing your data? 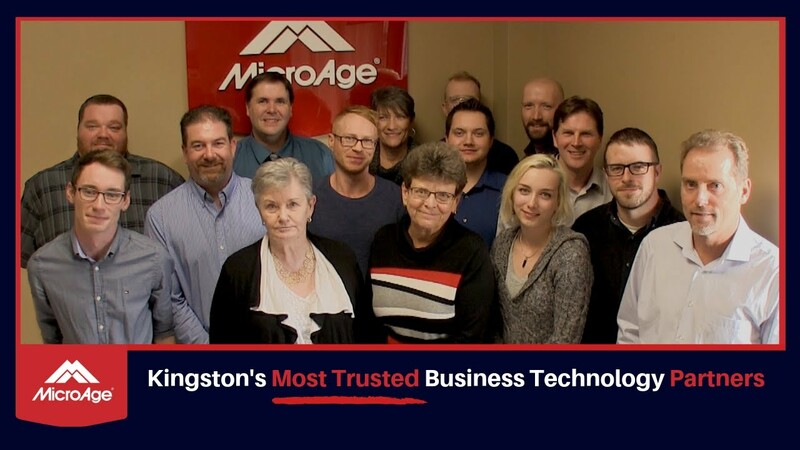 No matter the challenge your business is facing in IT today, MicroAge Kingston is strategically positioned to partner with you and help you work through the best solution for your unique set of circumstances. We watch over your technology, so you can work...play...live...sleep. Our complete IT department monitors, manages, maintains and optimizes your IT assets and services for you. Gain peace of mind and maximize your resources. Essential for E-mail and office applications Office 365 can now be your sole tool for online meetings, document storage and meetings, compliance, and even private social networking. Our experts specialize in IT business solutions. From the initial discovery and planning stage through to final implementation, our consultants are here to help. Let our team manage and automate all aspects of your printing devices for you. Reduce costs and simplify your printing. Take advantage of "on- demand" IT experts to help you with your projects. Our prequalified and specialized IT pros can help you to fill temporary staffing vacancies. Technology affects every area of your business. That’s where we come in. Whether you’re troubled by the list of problems above, or you’re just wondering if there is a more efficient, cost effective way to be doing what you’ve been doing forever. MicroAge Kingston approaches your business with fresh eyes and expert knowledge. Our service offering provides a basis for starting the conversation. Take a look, and call us when you’re ready for that personal discovery conversation with Shawn, Dan or Rick. The transition to Office 365 was as seamless as I could have ever expected. During the lead up to go live, the MicroAge team kept me in the loop and answered my questions. The MicroAge team goes above and beyond for us here with this project and regularly scheduled visits and their customer service is remarkable. Office 365 helps secure Microsoft from modern phishing campaigns Phishing attacks are relentless. What are you doing to help prevent them from hitting your business? At MicroAge Kingston, we want to help make sure your modern business has the tools you need to stay protected. How To Win With A Tech-Forward Customer Experience With countless options for every product or service imaginable, customers often look at businesses as commodities. At MicroAge Kingston, we understand that business owners need to be clever about standing out from the crowd and setting themselves apart. What is Cloud Migration and Why is it Important Your customers have more options than ever, and businesses of every type in every industry are responding. Customer story: Jumeirah Hotels How might your business change if customers actually read your emails? At MicroAge Kingston, we understand this can make all the difference in the world!